We've just secured an artist alley table at year's Dragon-Con on Aug. 30-Sep. 2 at the Marriott Marquis, Hyatt Regency, Hilton Atlanta, and Sheraton Atlanta. "Give me manga or give me death!" is the creed all hard-core otaku live by. 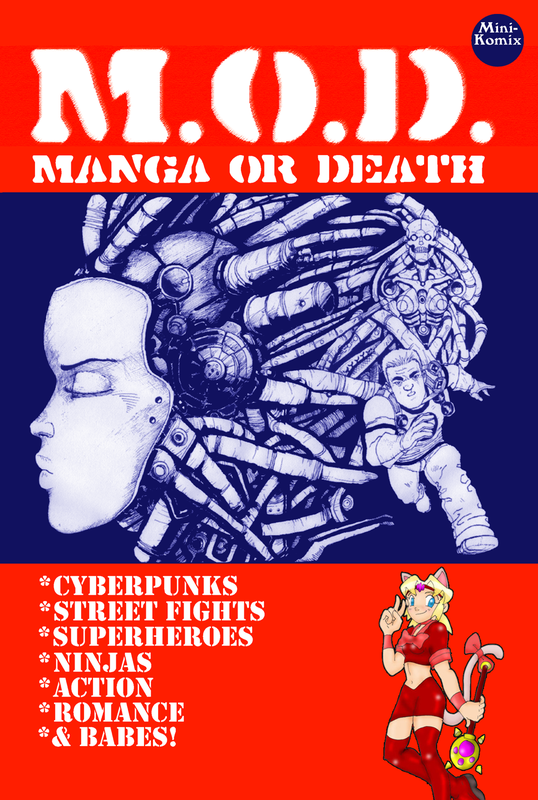 So this new digital version of our manga anthology is sure to satisfy any fan of the genre. Starting up is the cyberpunk thriller of Dangerous Machines, written by Nate Hill & drawn by Deleon Walters. Next is the martial arts action of Rooftops, written by Adam Wilson & drawn by Beatis Vir. Lastly is a one-shot special of the magical girls, the Sushi Senshi from Senshi Vs Sentai, written by Ryan Chamberlain & drawn by Rick Butler. More manga madness than you shake a moon wand at! You can catch it at Drive Thru Comics. No other place in either anime or manga has centered itself more than in a high school. So, here's three short comic stories each set in their own unique high school setting. There's High School Sweethearts by Willie Jimenez where two troubled teenagers work through their feelings. Next is Furry Ninja High School: Version 2 by Jer Alford and Bar-1 based on the popular Ninja High School series by Ben Dunn(but with furries!). Plus, Gaijin Hi by Jer Alford and Amanda Garmen about an average schoolboy becomes the center of a new exchange student's affections that just happens to be a catgirl from Mars! Lots of shoujo fun and hijinks in this manga anthology! You can now get this online for FREE at Drive Thru Comics and Lulu.